Science has established the existence of climate change and related anthropogenic activity as the leading cause of it. There is a need to understand climate science, the implications on various regions, resources, societies, and to study ways of mitigating its impacts. Role of policies and measures are also equally important. 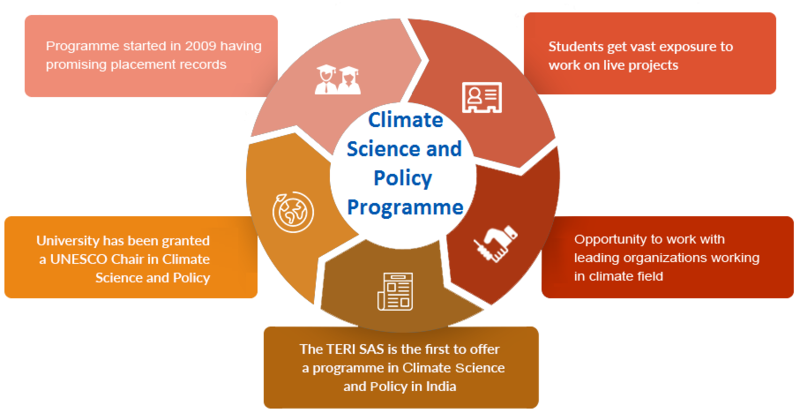 The TERI SAS offers an intensive four-semester MSc programme in Climate Science and Policy intended to imbue present and future professionals with practical and theoretical knowledge in the area of scientific and policy issues relevant to climate change. The programme is indeed a need of the hour - an area that requires inventorization, projections, possible ways of mitigating emissions, assessment of possible impacts on humans, habitats, resources, and exploring adaptation options. The programme provides explicit inter-disciplinary knowledge and training in adaptation and mitigation issues and understanding of tools and techniques relevant to the subject. Moreover, it enhances the understanding of national and international policies, laws and regulations applicable to climate science and policy. Ecology Trip: The ecology trips conducted in the first semester accentuated on helping the students understand the basics of the course and the intertwining of these concepts, which is required to achieve a certain depth in the subject. The trip covered various ecosystems present within the city limits and the outskirts of New Delhi. Students visited the Northern Ridge Forest, Asola Bhatti Wildlife Sanctuary, forest patches in Jawaharlal Nehru University, and the Aravalli Biodiversity Park. Biodiversity Trip: Students of Biodiversity Assessment and Conservation subject visited the Agumbe Rainforest Research Station (ARRS) in Karnataka to obtain a pragmatic understanding of the ecosystem dynamics of a forest system and also its social aspect. Students were divided into teams and were assigned different projects that in turn helped them in understanding various techniques and methodologies that shaped their comprehension of the framework required in carrying out biodiversity assessment and social analysis. Workshop on "Basic Satellite Meteorology and Environmental Application," March 26-28, 2014: A three-day joint training workshop was held on Basic Satellite Meteorology and Environmental Application. Students from the TERI SAS and many other institutes participated in the workshop. Students learnt about various topics such as basics of monsoon forecasting, interpretation of satellite imageries, and identification of weather features in satellite imageries. The program is of a kind which provides you an opportunity to meet eminent people who are working in the same field where you want to excel. Also teaching faculty in the program comes from different background an knowledge base and that really help us to understand the multidisciplinary angle hidden in the program, which proved extremely helpful during my job. CSP programme is one of its kind and it's a programme in which TERI is a leading research organization. It sensitizes students to current climate issues and equips them with requisite tools to enter the climate research work force. Bridge Courses: The aim of the Bridge Courses is to help students from diverse backgrounds to prepare themselves for the demands of the program. Students who have not studied the below mentioned courses previously should take these bridge courses. These courses will be offered during the start of the semester 1. * Bridge courses are provided with a aim to help students from diverse backgrounds to prepare themselves for the demands of the program. MSc Climate Science and Policy is an intensive four-semester programme intended to imbue present and future professionals in the arena, with practical and theoretical knowledge in the scientific and policy issues relevant to climate change. The program is designed to impart practical knowledge relevant to solve climate related problems. In each semester dedicated field study component provides practical understanding of society and science connect. The program concentrates on evolving critical thinking skills by involving students in regular discussion-based seminars and workshops. Students who complete the program successfully take with them fundamental knowledge of climate science and atmospheric processes, collaborative research experience, and many more intangible skills such as disciplined thinking. In program we promote reading and give presentations on scientific-journal articles. This helps them to understand research design and data interpretation work in more structured manner.